There was one last long sailing trip from Cholon, Colombia to the closest San Blas islands in eastern Panama, before Mark and I could finally slow down. The journey was 145 miles long and we hoped to do it as an “overnighter” with the day hours on each side. We had already been checked out of the country on December 21st (our agent Paola received our passport stamps the day before she went on vacation and said that “wouldn’t be a problem”) and our zarpe (check-out paperwork) mentioned December 25th, plus the 24 hours extra you are allowed to stay, this meant we had to leave Colombia on Monday morning, December 26th the day after Christmas. On Tuesday, we only needed one hour in the morning to compare weather models and make a decision. It seemed like the wind predictions were similar to the day before; we were taking the plunge. Rested a bit and not intending to confront the officials, we left Cholon around 8am, bound for Isla Pinos in the San Blas islands. 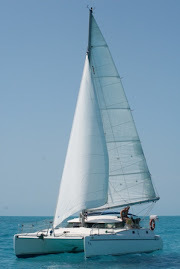 We raised our mainsail in vain and motored southwest. There was absolutely no wind! We motored for 7 (!) hours, first in flat seas, pleasant enough, then the big swell from weather systems further afield caught up with us and we had to drop the sail again (not that it was helping at all) to avoid banging and damaging of the rigging. Around 3pm we were sick of the noise, smell, extra hours on the engines and fuel consumption (motoring is not really our thing), we pulled both sails out and turned the motors off. With less than ten knots of wind from behind, Irie was moving along at around 3 knots an hour. At this pace, we would have to be “out” for two days and two nights! Only about two hours later, things changed drastically. All of a sudden, there was wind! When Mark took his first night shift and I went to bed at 6pm, Irie was sailing along nicely at a little over 5 knots and things were looking bright again… When I took over three hours later our speed had increased a tad and the sailing was just wonderful with bright stars shining above and sparkling phosphorescent in our wake. There was no other traffic, no other life on the water at all. The night progressed and when it was my night watch again at 3am, we were flying. The waves had grown potentially with the wind increase, but as long as we were moving steadily, and we were at over 7 knots, it wasn’t too bad. By now, it was blowing 15-20 knots from abeam and I considered reefing, but hoped it could wait until the sun came up. Once in a while, a wave crashed into the cockpit, leaving me soaked. During the last stretch of the trip, we did put a reef in the mainsail and cruised towards Isla Pinos at about 6 knots. By 10am on December 28th, Mark and I dropped anchor off a very tropical looking island in the San Blas. We had gone from being worried about not making the anchorage by dark, to arriving mid-morning, making incredible speed! Too bad we had to motor for so long in the beginning, but that’s life on a boat… The sky was grey (the rainy season just finished the day before) and the water murky, being so close to mainland Panama, but one look towards shore revealed sandy beaches and hundreds of palm trees, a traditional village made of wood and thatched roofs in the distance and a few Kuna Indians paddling about in their dugout canoes.